World figure skating champion Michelle Kwan and NASCAR champ Carl Edwards talk to kids in preparation for the First Lady's event in Des Moines event. Around 10,000 school kids have packed Wells Fargo Arena in Des Moines for an event featuring First Lady Michelle Obama. 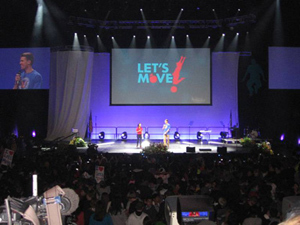 She’s in Iowa starting a four-state swing to celebrate the second anniversary of the launch of her “Let’s Move” initiative. The kids are hearing from the likes of Olympic gymnast Shawn Johnson and I.S.U. basketball coach Fred Hoiberg about the importance of physical activity. They’re also being entertained by American Idol Season 9 finalist Katelyn Epperly. U.S. Agriculture Secretary Tom Vilsack also spoke – asking the kids to insist their schools offer healthy lunch and breakfasts. “So we can improve what you eat at schools because we want more fruits and vegetables and more whole grains and low fat dairy in your diet. And less fat, and less sodium and less sugar, so that you can be healthy and active and the very best students you are intended to be,” Vilsack told the kids. Mrs. Obama will be speaking soon and will be introduced by Governor Branstad, who is leading an effort to make Iowa the Healthiest state in the nation by 2016.